I first met Jay when he pledged my fraternity in college. He was soft-spoken, brilliant and had a certain je ne sais quoi about him that made him look somewhat crazy. It might have been his deep-set eyes or his often spasmodic mannerisms, but there was something about him that didn’t match the rest of his demeanor. On the one hand, I had met a polite, generous and ambitious kid who would do anything for his friends. But there was always that glint of madness that he carried with him. I didn’t really figure out the source or reason for that until I first went skiing with him. While on the slopes, I quickly discovered he was a speed demon with a taste for trees and cliffs. In one day it all made sense. While he was more than willing to go to Costco and supply us with a veritable bounty of amazing food and selflessly devote himself to even the tiniest favor in the morning, he would bring you to the edge of a double-black diamond in the afternoon. The mountain was his realm and he made sure you knew it. This is not to say that he was ever boastful of his skills. In fact, I can’t think of a single time in which he touted a personal accomplishment that didn’t result in injury. His stories would routinely end with splinters of wood lodged in his helmet, his head tilting ever so slowly with each additional detail. And yet, if you didn’t feel like plunging down his jagged, perilous idea of a fun run, he’d be completely fine with it, and take you to a different path with fewer detours to the emergency room. 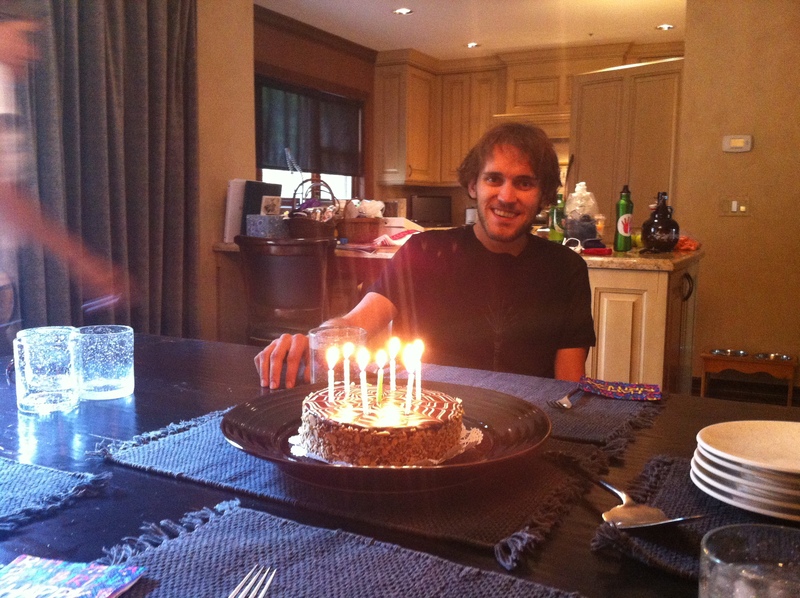 For as intense as he is on a ski slope, it has never overridden the fact he’s one of the nicest people I know. So when he signed up for the Leadville Trail 100 Race and asked me to be part of his crew, I hopped aboard without hesitation. As the picture above illustrates, I didn’t accidentally add a zero to the title of the race. It literally is a hundred-mile race, run continuously by one person on foot without sleep. When I first got into endurance racing I thought the marathon was the longest distance, the ultimate test of one’s strength and determination. It only took a few clicks through Wikipedia to find races that made 26.2 miles seem like the 3rd grader trying to play with the high-school kids. 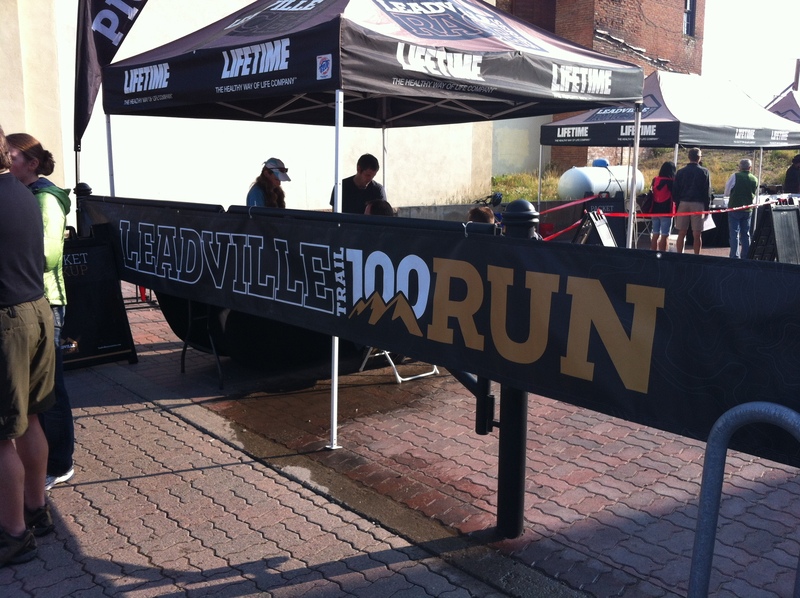 And if covering 100 miles on foot didn’t seem impossible enough, Leadville takes place at 10,000 feet and with lots of mountains to climb. While it takes a certain strain of psychosis to even contemplate registering for a race of such incredible distance, it wasn’t without precedents. Jay had started running around the same time as me but as a Coloradan, rather than hit up the road racing circuit, he became a master trail runner. The day I finally broke four hours on a flat, friendly marathon course, he finished his first 50k at altitude. 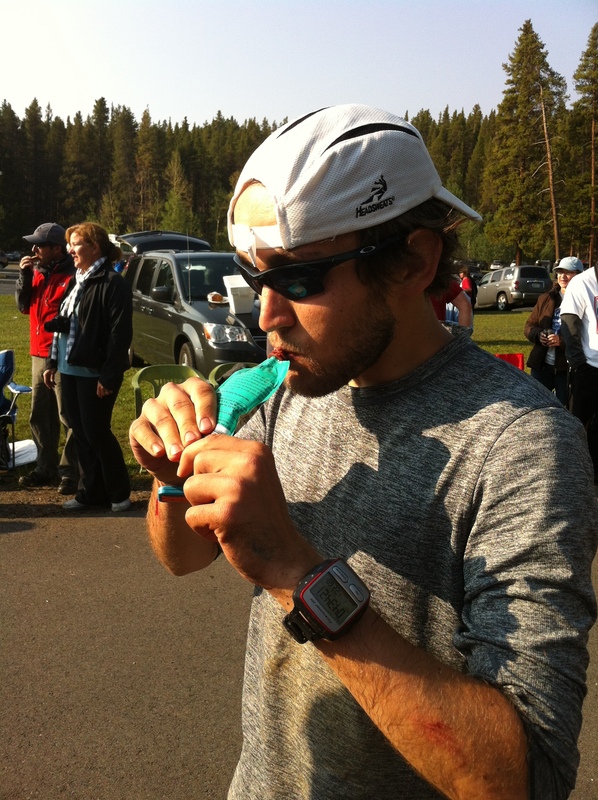 That same summer he would follow up this accomplishment by completing the Leadville Silver Rush 50-miler. Yes, that’s almost two consecutive marathons at over 9,000 feet, run solo. 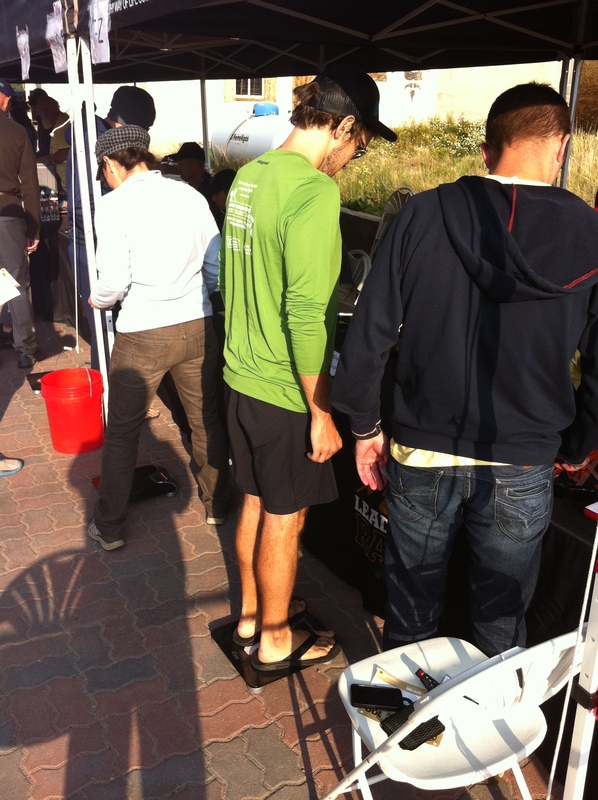 Jay gets weighed at packet pickup. If you lose more than 7% of your body mass during the race, you’re encouraged to stop. 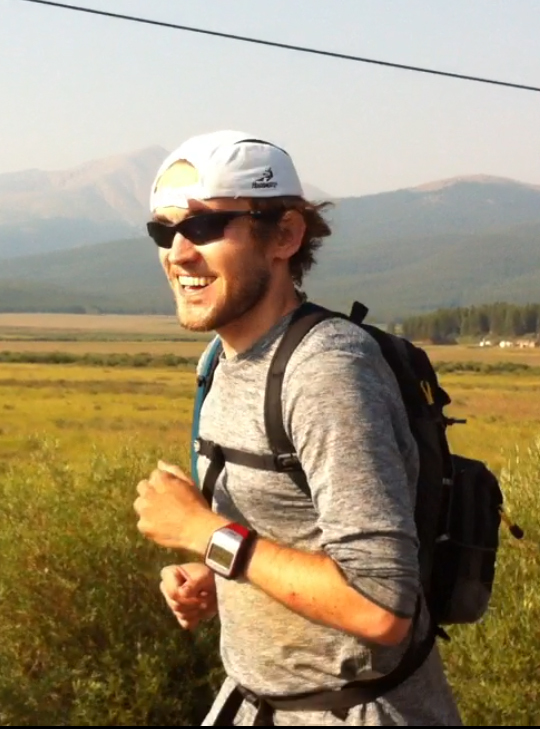 As you can imagine, the training for a 100-mile race is just as grueling as the event itself. I remember being slightly confused when I was training for my first marathon almost three years ago upon learning that the maximum distance most runners cover prior to racing was 20 miles. How is it possible, I thought, to cover the last 6.2 miles if you’ve never ventured into the distance? And yet, leading up to this behemoth of a race, the longest distance Jay had run, which is what most programs will recommend, was 31 miles. So while I worried about 6.2 paltry miles, Jay was faced with running 69 miles longer than he had trained, and 50 longer than he has ever covered at one time. To us normal runners (which much of the world already considers insane), no frame will fit around this situation to help us understand. Really, there’s no way to paint the ultrarunning portrait without using a crooked brush. I guess you just have to do it first. And yet, as I stood at packet pickup, watching Jay get weighed in, I couldn’t help but notice how friendly everyone was. Nobody came off as unhinged or even superhuman. It’s something I’ve heard a lot, but I got to live it firsthand – ultrarunners are an extremely welcoming and affable bunch. I guess Jay had found his people. Keep your thumb down – you need to conserve energy. We were up at 1:30 in the morning on Saturday, ready to drive 40 minutes to the starting line in Leadville, Colorado, the highest incorporated city in the United States. We arrived around 3 AM, about an hour before the race was to begin, but already most businesses were open. I kept saying it was Leadville’s Black Friday because the town of under 3,000 people seemed to be flooded with many enthusiastic (and hungry) potential customers. The race started on time, just a minute after pre-race favorite and two-time champion Anton “Tony” Krupicka hustled his way to the front of the pack. Jay was near the front, fueled by excitement, nerves and pureed baby food. But more on that later. 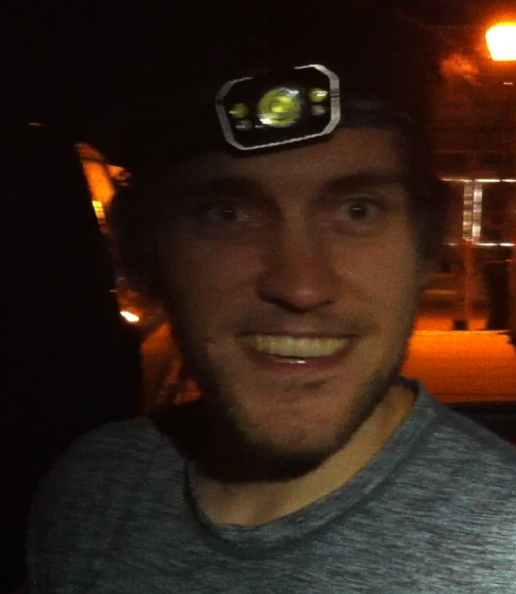 “I’ll see you guys in about a marathon,” he said to us before taking off with the horde. Runners aren’t allowed pacers for the first fifty miles, so we were largely responsible for his gear until then. After seeing them off, I went back to the enormous Dodge van he had rented to join the rest of the crew. There was his younger sister Kris, who was the first to call her brother crazy, despite being herself a monster on skis. Joining us was Kunal, a fellow Wildcat who was in charge of the toughest pacing leg of the day, and Chirag, who wasn’t running but kept conversation alive during down time. This last point was crucial as we were about to spend a long, long time together in cramped quarters. But first, we had to sleep. We arrived at the second major aid station, the Leadville Fish Hatchery, at around 4:40 in the morning and promptly fell into that stiff, half-sleep courtesy of a cold car. Dawn snuck up on us, signaling that we should start preparing for Jay’s arrival. He showed up about two minutes shy of his goal, with 23.5 miles already behind him. He made his way to the medical tent to bandage up some cuts and scrapes and then met up with us to dictate what he needed and how much of it. As we shuffled around the contents of our plastic food bin, I was reminded of some advice I had heard the day before from the race’s medical director. 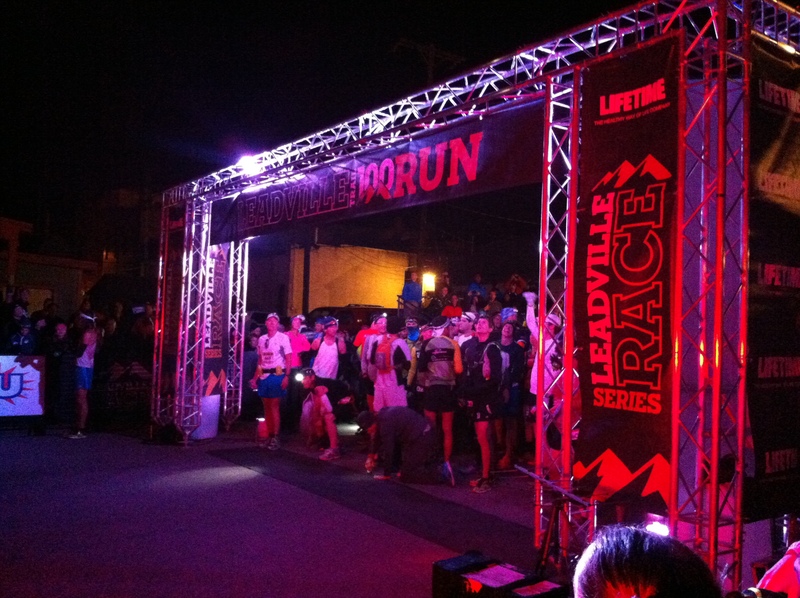 “Tomorrow is not an ultra marathon,” echoed Dr. John Hill in Leadville’s 6th Street Gym. “It’s an eating marathon with some running thrown in.” It made perfect sense. The human body is said to only be able to store about 2,000 calories for high-impact aerobic activities such as running, and at an average of 100 calories burnt per mile, that means most people would hit a symbolic wall at mile 20. This is why the last 6.2 miles of a marathon can feel like a death march. However, most runners can avoid that unpleasant feeling of energy collapse by sucking down Gatorade and munching on energy gels or sport beans. But when you have to run 80 miles past that storage limit, you have to learn to eat real food on the run and like a ravenous animal, even if your stomach is begging you not to. It sounded like there was no way to win. Damned if you don’t eat, vomit all over yourself if you do. I suppose given those choices, you’d opt for eating. Because of that, it was one of our jobs to make sure Jay ate. However, it wasn’t the easiest thing to do. You walk a fine line as a crew between respecting your runner’s needs and being a forceful and demanding jackass. From the beginning, Kris was adamant that we had to practically shove food down Jay’s throat because he would likely err on the side of too little. At that first aid station, her detailed knowledge of her brother was validated. “He’s not eating enough,” she said with a combination of concern and told-you-so cockiness. “If he himself admitted that he’s not eating enough, then that’s a problem.” Among the several foods that Jay did eat though, were some oat bars and a few packets of pureed organic baby food. Easy to digest and exploding with vitamins and minerals, they were a great addition to his arsenal. However, at only 80 calories per packet, they weren’t ideal for the long haul. I inspected his Camelbak and to my slight dismay, found three Stinger waffles unopened. After putting him back together, we sent him on his way to the next aid station at Twin Lakes, hoping that he’d nosh on some high-calorie snacks on the way. Faced with another 3-4 hour stretch of time to kill, we decided to fill it with fun conversations. Though we had brought a few games with us, we found time was flying by simply by talking. I hadn’t seen Kunal in almost six years, so it was the perfect time to catch up. I also got to know Kris, with whom I had never engaged in a long conversation, despite always being around whenever I’d visit Jay. These long gaps in between crewing duties ended up flying by pretty quickly and made the waiting game very enjoyable. It certainly helped that we were always surrounded by the majestic Rocky Mountains, gentle brooks and placid lakes decorating the otherwise harsh, but epic landscape. The next aid station was in the middle of a tiny town by the Twin Lakes reservoir. Since there was no place for 800 vans to park, crews were parking on the side of the highway leading into town, the farthest car about a mile away. After hauling our supplies to the aid station, it was time to wait for Jay. He eventually showed up, but the change was apparent in his stride. While he had zipped into Fish Hatchery with confidence, he was dragging his feet as he rounded the 40th mile into Twin Lakes. He emerged from the checkpoint with a huge slice of watermelon in hand and a cup full of salted potatoes. And then he sat down. 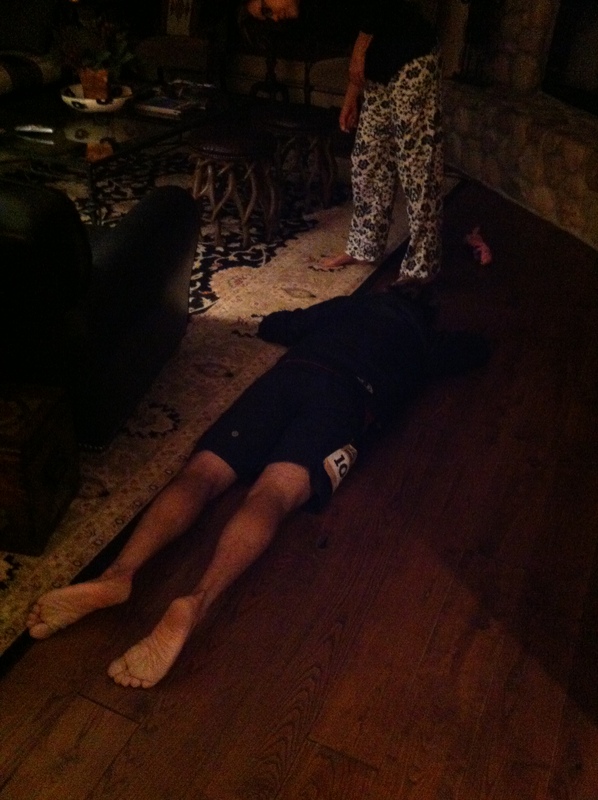 “My quads are killing me,” was the first thing he said to me. Though I’d expect one’s quads to be hurting after running 40 miles, it was tough to ignore the remaining 60 ahead of him. I walked with him to our crew station, where he sat back down. He wasn’t talking as much and his enthusiasm was waning. 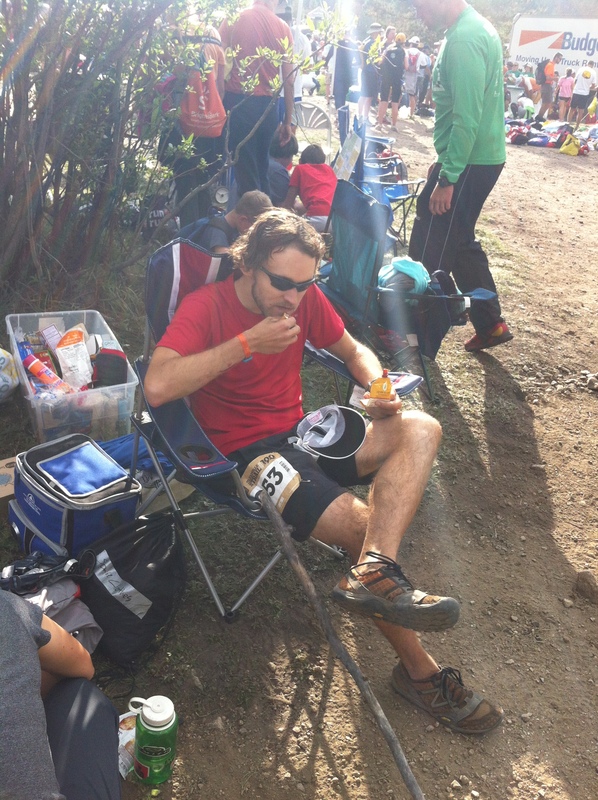 Though still hadn’t eaten enough and the caloric deficit had caught up to him, he ate a reassuring amount of food at this aid station. He threw back another pouch of baby food and some rice cakes in addition to the watermelon and potatoes. Kunal helped him re-bandage his hands from the spill he had taken earlier while Kris kept putting more food in front of his face in hopes that he’d bite. He was eventually up and back on his feet, shuffling towards the Hope Pass climb, ostensibly the toughest part of the race. Ninety minutes later we were at the Winfield aid station at the 50-mile mark and the turnaround. In between us and Jay was Hope Pass, the race’s highest point at 12,600 feet, rising dramatically from the earth with little subtlety or moderation. Jay would later describe it as walking up a black diamond ski slope, terrain so steep that the most you could do was power hike. Waiting in the campground we were completely surrounded by enormous peaks like frozen tempestuous waves of earth. It would be awhile before he would conquer the summit, so his crew did what it had been doing all day – wait in the van and eat, eat, eat. We had stuffed the car with croissants, peanut butter, apples, grapes, carrots, hummus, Clif bars, bagels and other energy-rich foods, all of which were being eaten at any given point in the day. We were hoping Jay was doing the same. By the time he showed up, he was looking halfway decent. He had found a walking stick and was cruising into the aid station with it, his stride having deteriorated very little in the last backbreaking ten miles. However, he was pretty far behind his expected pace and in danger of not making the next cutoff time. Each station shuts down at a certain time and all runners who reach them afterward are pulled off the course for safety reasons. Though Jay was looking much better than expected and was eating with surprising alacrity, we knew he would have to pick up the pace to make the cutoff times on the way back. He knew this too, but his quads, which he described as “dead,” weren’t going to help him hustle back up Hope Pass. I couldn’t imagine the pain he must have been in. It reminded me of something else Dr. Hill had said during the pre-race check in. I wonder if Jay would have accepted narcotics at this point. The Winfield station is so character building because you’ve just finished the worst of it but have to turn around and do it again. This time though, Jay would have Kunal with him, his first pacer of the day, keeping his spirits high and his stomach full. His attitude and eating habits at the station had certainly injected us with a rush of optimism, but the fact that he was flirting with the next cutoff time was ominously floating in the air. By the time we reached Twin Lakes again, it had started to get dark. I changed into warmer clothes, plopped in the van’s backseat and listened to music, ready for my pacing leg to start. It wasn’t long before we were engulfed by pitch darkness. Car headlights and tiny, bouncing headlamps piercing the wall of trees next to the road were the only companions to the stars. We put together Jay’s gear and walked it to the aid station. Once our mountain of stuff was settled, Chirag went to meet up with his friend Dimple and Kris rooted herself at the trailhead, waiting for her brother to emerge from the black of night. 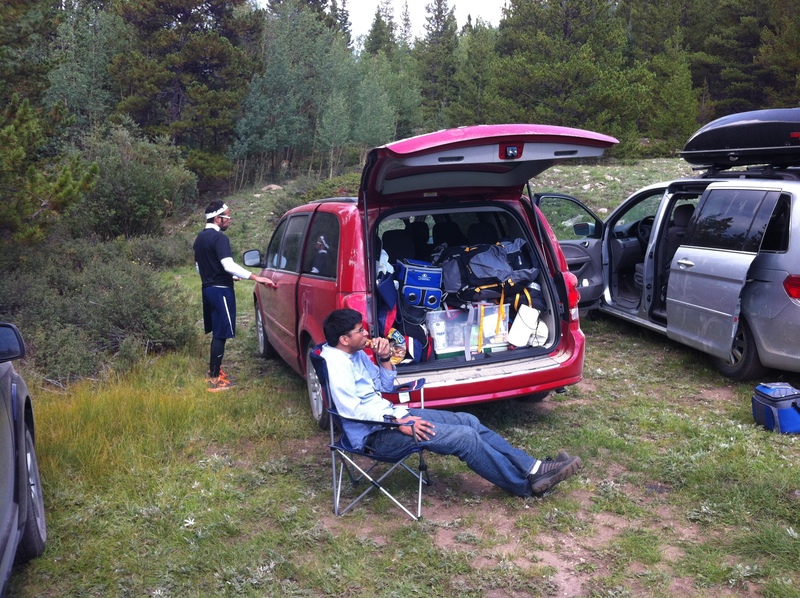 I sat with the gear and watched as runners entered the aid station to the cheers of a handful of people. Footsteps were rough and grainy against the dry dirt path and applause was muffled by gloves. 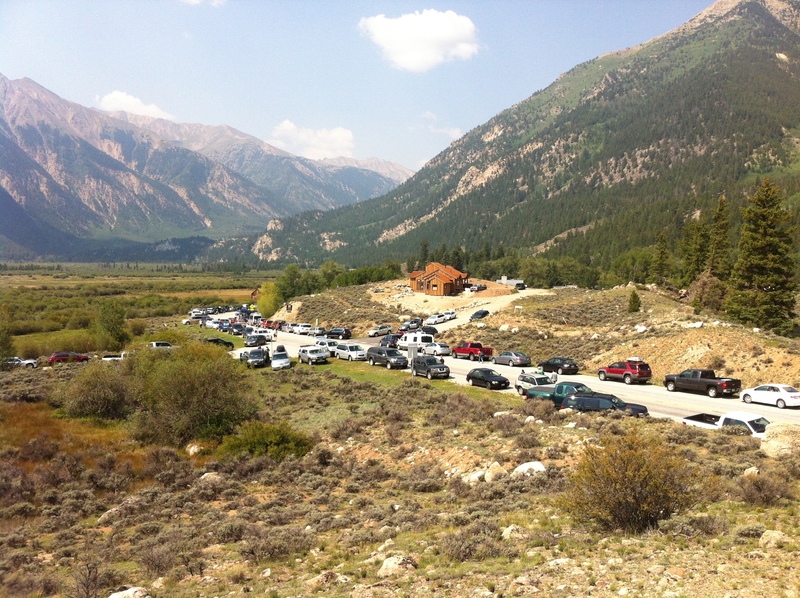 The closer we got to the cutoff time, the higher the frenzy rose around Twin Lakes. Volunteers and crew members alike were on phones and walkie-talkies, speculating as to when the race would make the call and shut it down. Every runner with a bib who entered town was met with rabid yells to keep going, to dig deep, and for the love of god, make that cutoff time. “I will commit, I won’t quit,” Cole Chlouber said, leading the congregation of racers and crew members in the event’s mantra the day before. “When the going gets hard and the time comes – and I promise the time will come – when the legs are dead and the head’s done, when the lugs are burning, that time, believe. Believe with me and dig deep. Take one more step. Turn that step to two, soon there’s an aid station. Keep digging.” Son of race co-founder Ken Chlouber, his words stuck to every runner, old and new, ready to embark on an unforgettable run. It is said and repeated in endurance circles that races of this nature are mostly mental (and yes, there’s a pun to be made there). At several points, the body will break down and tell you to stop by hurting everywhere. But they say that you have to overcome that pain, embrace it and transcend it if possible. Because no one aside from the physically gifted will run this far or this long without putting themselves through some serious agony. Every runner that I saw at this station, runners who had put over sixty miles of punishment on their minds and bodies, must have repeated Chlouber’s words to themselves more than once to reach that point. With forty miles still to go, they’d need every ounce of inspiration available. 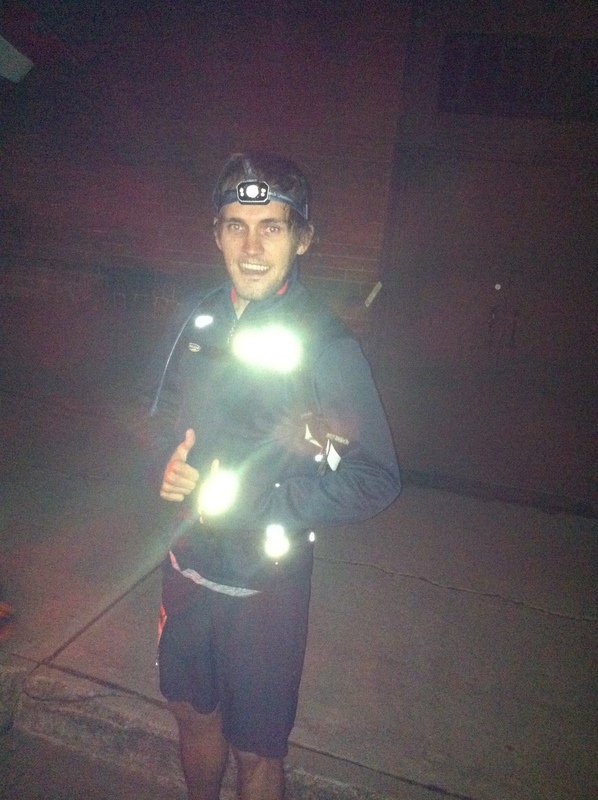 I eventually joined Chirag and Kris by the trailhead, where distant flickering lights were transforming into tired runners and fellow pacers. Eventually one light came towards us without the steady bounce of all the others, like a drunk firefly still reeling from a bar fight. Once it was ten feet in front of us, we realized it was Kunal. “Whoa, hey guys,” he said in a slight stupor before telling us Jay was a few minutes behind him. He barked out some food requests and Chirag and I hustled back to the car. We brought the gear back just in time for Jay to materialize with his trusty walking stick. He was still putting one foot in front of the other and smiled when he saw us, but we all knew the painful truth. He had missed the Twin Lakes cutoff time. The race was over. We packed everything into the trunk of the van with the usual Tetris-like precision and made room in the back for Jay. You could almost hear his joints crack and split as he slowly slid into the backseat like an old man with boulders strapped to his feet. It didn’t take long for him to fall into a woozy sleep. Chirag and Kunal left Twin Lakes to head back to the city with their friend Dimple, who was kind enough to have driven out to the middle of nowhere in the middle of the night. Despite not having run a single mile that day, I passed out on the ride back to Beaver Creek, leaving Kris to make the midnight drive with just an iPod and her thoughts. An hour later, we were back at his house in Beaver Creek. It took him twice as long to get out of the car, his legs having locked into place. He somehow made it up the stairs into the living room, where I found him face down on the floor. There was no real cause for concern though. Rather than painfully hoist himself up another flight of stairs to shower, he decided it would be best to sleep on the hardwood floor and deal with hygiene at a later time. His bib was still attached to his shorts, and he would find out in the middle of the night that he still had a tube of Perpetuem solids in his pocket. On occasion, one of his two bearded collies would come and lick his salty face, prompting absolutely no reaction from their exhausted master. I doubt they knew that he had just gone through one of the longest days of his life. If it’s true that you are what you eat, then the next morning I was a carbohydrate, plain and simple. I had spent all of Saturday eating grains and fruits at regular intervals but didn’t get to use them. 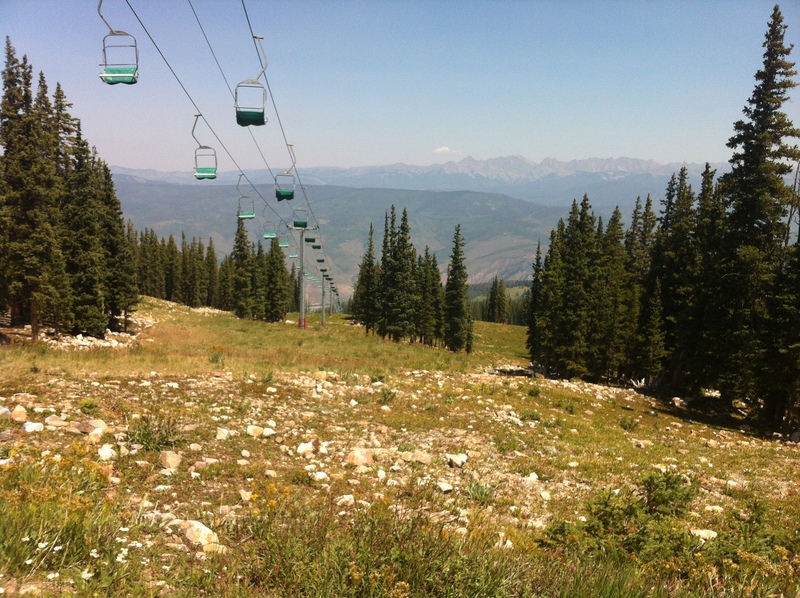 So Sunday morning I decided to run from the base of Beaver Creek to the summit via the Cinch catwalk. It was seven miles of a winding, rocky dirt path to the top. And then I ran back down. Beautiful vistas, familiar runs made new and exciting by the absence of snow and lots of heavy breathing at 11,000 feet. 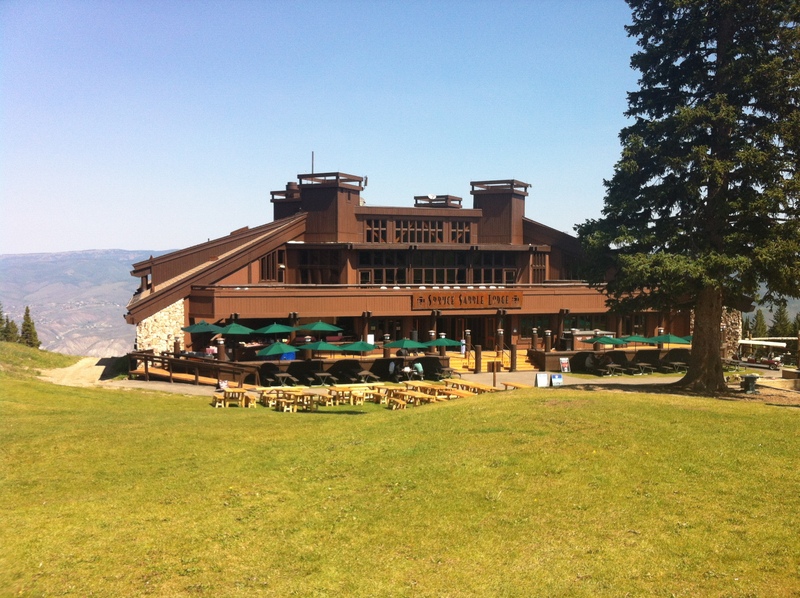 My summer 2012 altitude challenge was complete. I returned to find Jay sitting at the kitchen counter, talking with Kris and his parents. Aside from the fact that he had an extremely stiff and slow gait, you would never guess that he had spent the entire previous day running up and down the Rockies. The aches and pains that Saturday had provided were being slowly remedied by Sunday’s food, couch cushions and early birthday treats. Though I wasn’t able to pace him, it was still an amazing weekend in Colorado. Over the years, I’ve gotten to know Jay and his family pretty well, and every encounter with them is full of great stories and delicious food by the truckload. There’s never a dull moment with them because, let’s face it, their particular brand of lunacy is as contagious as it is genetic.